With informed support, students at the K-12 and collegiate levels can overcome the obstacles of ADHD and other learning disabilities. Drawing on evidence-based techniques, this book provides school psychologists, counselors, and consultants with the best diagnoses and treatments to help their clients become effective students. 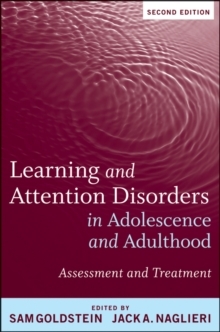 It includes a thorough overview of LD and ADHD, as well as a set of guidelines to assist adolescents and adults. This is important reading for practitioners in education and mental health working to create learning programs.